Can controllers this tiny and toy-like in appearance really do a serious job in the studio? While big may have its advantages, it's not necessarily clever when space is at a premium, or if compactness and portability are of importance. Korg's dinky Nano control surfaces have been designed very much with laptop musicians in mind, although that's not to say they wouldn't be eminently useful in a larger studio setup. There are three controllers available in the series: the Nano Key, the Nano Kontrol and the Nano Pad. Imagine taking an axe to a larger MIDI keyboard controller and hacking it into three separate parts, consisting of the keyboard, the knobs and sliders, and the drum‑trigger pads. Hey presto, you've got the Nanos, which are very neat, very small and, it has to be said, desperately cute! Each controller measures 320 x 83 millimetres and is around 15mm thick. They can be used individually or all at the same time, assuming you have the USB ports to spare. No additional power supplies are needed, as the units are USB bus powered, which keeps the cabling to a minimum — just the way we like it. A USB to mini‑USB cable is helpfully supplied with each unit. If you need to connect the Nanos via a USB hub, it should be of the powered variety, otherwise connections must be made directly to the computer's USB ports. The Nanos' mini‑USB sockets are sensibly mounted on the ends of the units, so two or more Nanos can be positioned one above the other. Construction is almost entirely of plastic, and while the units feel solid enough for their size, I'd be wary of getting too carried away in the heat of the moment, especially in the case of the Nano Pad, which is likely to receive many severe poundings during its lifetime. If you're tempted to use drumsticks, just make sure your aim is good! 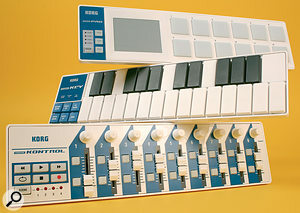 Two software components are required to bring full functionality to the Nanos: the Korg Kontrol Editor and the Korg USB driver, both of which can be downloaded from www.korg.com. Although the Nanos will function out of the box without either of these (using basic system drivers), you will not be able to program them to your own requirements. 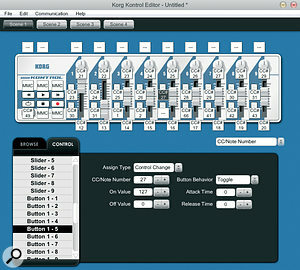 Hence the need for the Korg Kontrol Editor, which itself needs the Korg USB driver in order to work. All that's required is to install the driver first, then the Editor, and you're ready to rock. The Kontrol Editor is a stand‑alone application that provides access to all the editing tools required to program the Nanos to fit your own applications. When the program is started, it checks to see which controllers are connected, and displays them in a list. Simply select the Nano you wish to edit, and that particular Editor screen appears. If only one Nano is connected, the program opens its Editor directly without showing the selection screen. Rather than describe each Editor's parameters in full detail here, I've discussed their main features below in the sections describing each Nano. Editing is very intuitive and straightforward, and the principles are the same across all three Editors. You either click on a physical object's name from the Control tab on the left, or click directly in an object's value box on the graphical representation. Each object's available parameters are then shown below the graphic, and you can adjust their values. Objects usually have several parameter levels — for example, whether a button will send a note or a control message, its MIDI channel, velocity curve, and so on. For any button that is sending MIDI CC messages, you can specify the on/off values; in the case of a knob or slider, the minimum and maximum value range can be specified. Virtual organists will be pleased to know you can invert the values of sliders on the Nano Kontrol, so that they operate in the same direction as organ drawbars. Some buttons even include attack and release time parameters, enabling ramped CC value transitions between on and off states. Both the Nano Kontrol and the Nano Pad offer four Scenes (Nano‑speak for 'presets'), which are presented in their Editors as four tabbed pages. Individual parameter values can be copied and pasted within a Scene, or between Scenes, and whole Scenes can be copied and pasted to another. Managing this information is very simple: you can save individual Scenes to disk, or entire Scene Sets (all four Scenes as one file.) The handy tabbed file browser on the left allows for quick reloading of your saved Scenes and Scene Sets. There is, however, a major gripe coming up. Any edits you make do not update the Nano hardware in real time — you have to 'write' the data to the hardware before they take effect. That in itself is not so bad – the problem is that the Editor cannot transfer data to the Nanos while your host DAW is running — at least, that's the case when using Sonar. This may be because the Nanos and Sonar are both using the same USB Audio Device port; nevertheless, it's a very irritating situation. It means that you can't audition any changes without first saving your DAW project, shutting down the DAW, writing the data to the Nano and then re‑opening your DAW project to hear the results of your edits. In the troubleshooting section of the PDF manual, Korg acknowledge that this problem may occur. I'm not sure why the two pieces of software should not work in tandem, nor why edits can't be auditioned in real time. Hopefully it's an issue that Korg will correct in future updates. The Kontrol Editor, showing the Nano Kontrol's settings. These pages make it simple to adjust and save each Nano's parameters, although you may have to restart your DAW to implement changes. The simplest of the three units, the Nano Key is a 25‑note miniature keyboard spanning two octaves from C to C. The velocity sensitive keys are rather like inflated rectangular calculator buttons, with a choice of three velocity curves and a fixed velocity option, as well as a transpose facility covering plus or minus 12 semitones. The angle at which keys are pressed is fairly crucial, and misfires are common owing to the nature of the beast. Similarly, judging velocity accurately can be a little hit‑and‑miss, but you do get used to these foibles with a little practice. While its size obviously precludes it from accommodating any form of continuous pitch and modulation wheels or levers, Korg have compromised by employing two buttons for pitch‑bend and modulation — rather reminiscent of those found on the vintage ARP Odyssey analogue synth. Curiously absent from the Mod button parameters are attack and release time — the modulation jumps to its programmed values the instant you press or release the Mod button. The Pitch Up and Pitch Down buttons activate pitch‑bend, and in this case you can specify the speed at which the pitch‑bend occurs. Above these are Octave Up and Octave Down buttons (on the review model, the Octave Up button is erroneously labelled Pitch Up) providing a total range of nine octaves, with LEDs indicating the currently selected octave. Impressive‑sounding virtuoso passages can be performed quite effortlessly by deftly flicking through the octaves while playing a fast phrase — all without changing your position on the keyboard! Finally, the CC Mode button transforms the keyboard into 25 MIDI controller switches, each with its own CC number and on/off values. Like the Mod button, these switches transmit their values instantly, with no attack or release time option. Each key can be set to function momentarily or to toggle on/off with alternate presses, and each key can also be disabled from sending controller data. Many people are used to programming drums on velocity‑sensitive finger pads — a method pioneered by the infamous Linn 9000 drum machine, eventually popularised by the Akai MPC series, and subsequently adopted by other drum machines. The Nano Pad's trigger pads respond surprisingly accurately to playing velocity; all they fail to do is light up when you hit them! There is a choice of three velocity curves and fixed velocity, which apply globally to all pads. Each pad can send up to either eight simultaneous notes or eight simultaneous MIDI controller messages. Each of those eight control messages can have its own on and off values. Like the Nano Key, there are no attack and release time parameters for the pads' controller data. Pads can either transmit on a single global MIDI channel or on independent channels, their behaviour is either momentary or 'togglable', and any Pad can be disabled altogether. Supplementing the trigger pads is the X‑Y pad. A choice of pitch‑bend or any CC number can be assigned to either axis, in positive or negative polarity. The X‑Y pad also has an optional Touch/Release mode, whereby a third MIDI controller can be activated whenever the pad is touched. 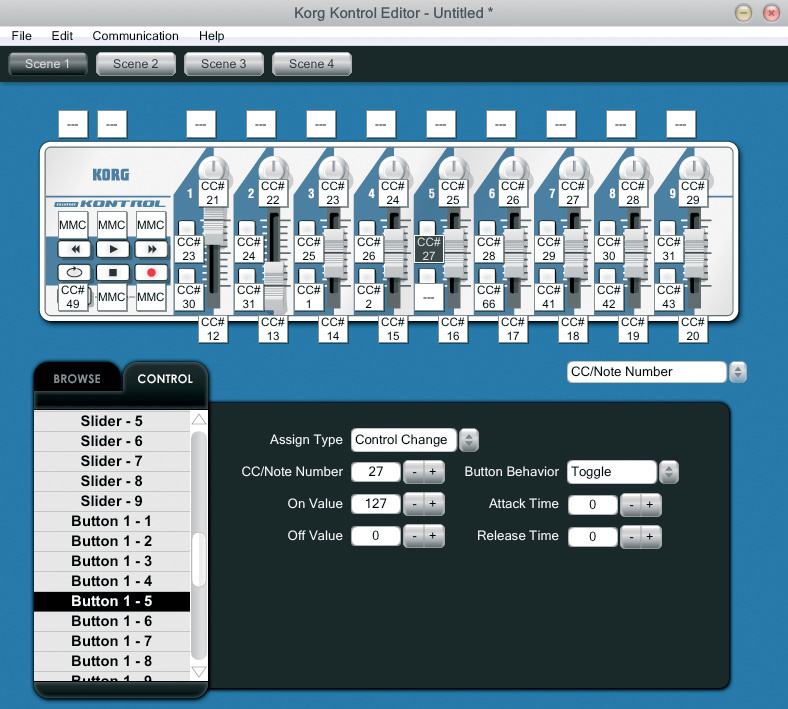 The on/off values and attack/release time of this third controller can be specified in the Kontrol Editor. The X‑Y pad can also work in tandem with selected trigger pads to produce rolls or flams: activate the Roll button, press and hold a trigger key, and move your finger around the X‑Y pad. Movement on the 'X' axis (sideways) varies the speed of the roll or flam, while the 'Y' axis (up/down) varies the note velocity. Moving your finger around in a circle while rolling produces dizzying results that would be almost impossible to program in any other way! In the case of flams, the X‑Y pad must be touched before hitting a trigger pad — the velocity ('Y' axis) alters the volume of the second strike. Finally, the Hold button acts like a sustain pedal for the X‑Y pad, retaining the most recent roll‑speed and velocity values from when the pad was released. The Nano Pad was the only one of the three units that exhibited any sort of fault: in this case, it continually insisted on killing Sonar's audio engine every few minutes, even when the unit was not being played. Unless the Nano Pad hardware itself is software updatable, this behaviour may not be correctable. It would be interesting to know if other DAWs are similarly affected. The mini‑USB port is the only connection found on each Nano. It should also give you an idea of just how small they are. This, for me, is the pick of the bunch. Having used a Roland A50 as my main keyboard for the last 20 years, I find the Nano Kontrol an excellent means of squeezing some extra useful life out of the old workhorse. This little gem offers a generous complement of nine sliders, nine knobs, 18 buttons and a set of DAW transport controls thrown in for good measure. 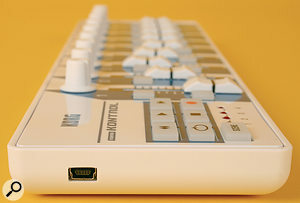 I've experienced a number of 'ultimate' MIDI keyboard controllers of late and, quite frankly, the Nano Kontrol knocks most of them into a cocked hat in the knob, slider and button department. My initial expectation was that the knobs and buttons would feel cheap and scratchy, but they don't. They have a pleasing, 'oily' smoothness, and the buttons feel reassuringly positive to the touch. When set to transmit CC messages, the Nano Kontrol's buttons enjoy the additional luxury of independent attack and release times, ranging from instantaneous response up to a maximum of 10 seconds — very useful for accurately timed filter sweeps, fade‑outs, effect modulations and other precision gymnastics. Each of the buttons can be either momentary or togglable. The six transport buttons are used to remotely control the transport functions of compatible software and devices, and can be assigned to transmit either MMC commands or MIDI controllers, according to the requirements of the receiving device. Although Sonar does not respond to these transport buttons by default, its transport functions can be programmed to react to external hardware controllers using either Sonar's proprietary Active Controller Technology (ACT) or its in‑built Control Surface plug‑in. I opted for the latter method using the Cakewalk Generic Surface, and Sonar's transport controls could then successfully be made to respond to the Nano Kontrol. Although Nanos can be purchased individually, being able to use any combination of the three simultaneously makes the complete suite particularly attractive. Three people can easily perform at once — one playing notes on the Nano Key and another playing drums on the Nano Pad, while a willing assistant mashes up the mix on the Nano Kontrol. This flexible approach could well inspire some spontaneous, Fame‑style 'let's do the show right here in the orphanage' moments. If you're somewhere on the north face of the Eiger and can't use a powered USB hub, or if you're simply short on USB connections, no problem: just connect one Nano at a time. When you're done with the first, simply unplug it and swap it for another — one of the great benefits of being hot‑pluggable. On a less Utopian note, the problems associated with auditioning edits proved to be a real test of patience, and the Nano Pad's Sonar audio‑engine serial‑killer tendencies would be a problem from a personal point of view. Nevertheless, the Nanos are fun, portable and more powerful than their tiny bodies would suggest. The best bit is the cost: if you shop around, you can pick up each of these units for an amazingly low price. How could anyone resist? • M‑Audio Trigger Finger, £102: 16 pads, eight knobs, four faders. • Akai MPD24, £132: 16 pads, six faders, eight knobs, transport controls. • Novation Nocturn, £80: eight knobs, eight buttons, one fader, advanced software functions. • ESI Key Control 25XL, £49: 25 keys, pitch/mod wheels, four knobs, one fader, two data wheels. • Akai MPK49, £273: 49 keys, 12 pads, eight knobs, eight faders, eight buttons, transport controls. • Novation Remote Zero SL, £240: 16 knobs, eight faders, eight pads, 32 buttons, Automapping. • Novation Remote 25 SL, £200: 25 keys, eight knobs, eight pads, 16 buttons, Automapping. • Korg Pad Kontrol, £160: The Nano Pad's big brother: 16 pads, X‑Y pad, two knobs, assignable pedal. • Behringer BCR2000, £90: 24 encoder knobs, eight integrated encoders/buttons, 20 buttons. • Behringer BCF2000, £123: eight motorised faders, eight integrated encoders/buttons, 20 buttons. • Evolution UC33E, £137: 24 knobs, nine faders, 14 buttons. The Nano Kontrol's functions out-perform those of larger, more expensive keyboard controllers. The Nano Pad repeatedly caused Sonar's audio engine to stop working. I couldn't write to the Nanos' memory without shutting down host DAW (Sonar) first. These dinky devices could be a boon to travelling laptop musicians, as well as studio musicians on a tight budget or with limited space. The Nano Kontrol, especially, will appeal to those using a digital piano as their keyboard controller, but needing an affordable means of control over their software and other MIDI equipment. Nano Key £52; Nano Pad £63; Nano Kontrol £63. Prices include VAT. Nano Key $62; Nano Pad $72; Nano Kontrol $72.